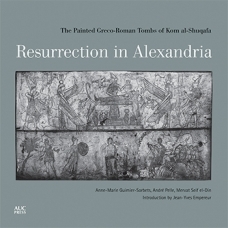 In the Greco-Roman catacombs of Alexandria, uniquely decorated tombs from the time when religious boundaries blurred and syncretistic beliefs flourished have long been known. But it was only in 1993 that researchers discovered faint traces of paintings on walls previously thought to be blank, or underneath other painted scenes: the hidden scenes could be partly made out and photographed using ultraviolet light. Then in 2012, new computer technology was used to reveal the lost images—and colors—even more clearly. Here the team present, examine, and interpret what they found, teasing meaning and intent from the alternating scenes of Greek and Egyptian mythology, as employed by the citizens of a multicultural Alexandria at the beginning of the second century CE, in pursuit of a happy afterlife.